The release of a new vintage cabernet sauvignon is always highly anticipated here at Rymill Coonawarra and none more so than our 2010 Rymill Coonawarra Cabernet Sauvignon. One of our finest cabernets yet (if we do say so ourselves) this wine is testimony to one of the best cabernet vintages on record. "2010 was just a great year! I can happily report that this 2010 vintage is one of the best Rymill cabernets we have produced yet. The wine has exceptional fruit expression and is testimony to the quality of fruit from our vineyard. Intense flavours and strong mouth-watering tannins run the length of the palate and make this wine incredibly smooth." Parcels of premium fruit were selected, fermented and then aged in French oak barriques to produce this full-bodied and richly flavoured wine. The Rymill 2010 Cabernet Sauvignon exhibits great vibrancy and freshness now, but will also develop beautifully with age. 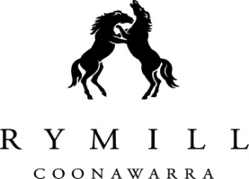 Recognised world-wide by two majestic bronze stallions rampant, the Rymill family's distinctive winery produces classic thoroughbred wines made exclusively from grapes grown in its own Coonawarra terra rossa vineyards.